They are expected to attract a crowd of 90,000, a post-war record for a fight in the UK, and on an evening which could define both fighters’ careers Klitschko will provide Joshua with his biggest test. He represents a significant step up in class for Joshua, whose temperament could be tested if Klitschko leans on him throughout Saturday’s fight and repeatedly ties him up in the same way he has so many others. 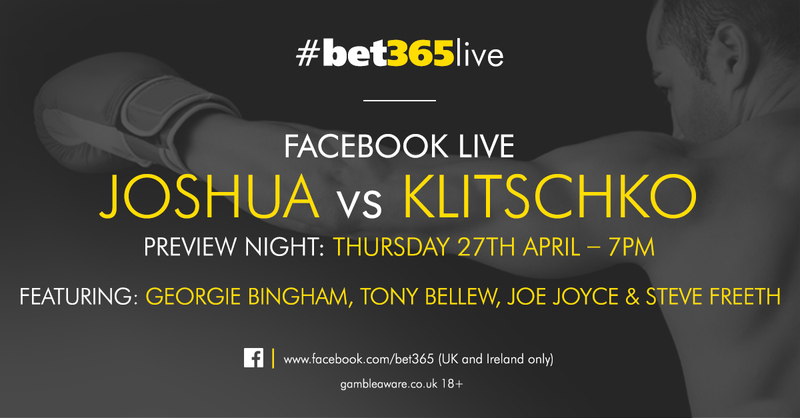 if you havent got tickets or access to sky then the next best thing is to watch with BET365 a live broadcast across Facebook & Twitter tomorrow night in preview for this weekend’s World Heavyweight fight between Anthony Joshua & Vladamir Klitschko at Wembley.